Foodservice sinks are classified by function. There are sinks designed specifically for washing hands, using at bars, filling and draining mop buckets, preparing food, using in conjunction with cooking equipment, and washing pots, pans, and everything else under the kitchen lights. Semiautomatic power sinks use high-powered jets of water of water to clean such items as pots and pans, rotisserie spits, utensils and even hood filters and oven parts with minimal scrubbing. Sinks are usually made of stainless steel for durability and easy cleaning. The steel can be type 430, which is 16 percent chrome content, or thicker, more durable type 30, which contains eight percent nickel. Sink components include a backsplash, compartments or bowls, a drainboard, front roll rim, legs and fittings. Bowls may be fabricated or deep drawn. In some instances, sinks are mounted on a wall, but they are typically supported by legs fitted with adjustable bullet feet for a level setting. In addition, you can also order braced legs that prevent wobbling. 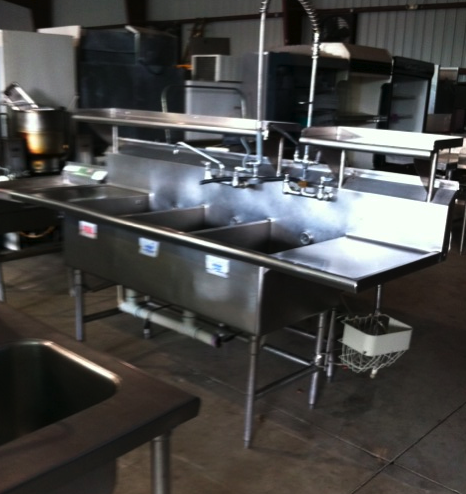 One Fat Frog Restaurant Equipment has several used sinks available including single, double, and triple sinks with or without hose sprayers, back splashes, drain boards, etc. One Fat Frog Restaurant Equipment is having a large sink sale, so if you are in the market for a used sink, act fast because One Fat Frog Restaurant Equipment won’t have this selection for long! One Fat Frog Restaurant Equipment is the only used commercial restaurant equipment dealer in the nation with its own in-house finance manager. This gentleman can get you financed no matter what shape your credit is in. One Fat Frog Restaurant Equipment also welcomes quick cash deals and package deals towards the entire selection of used commercial restaurant equipment including the wide variety of used sinks.